ATTENTION ALL CRAFTERS! 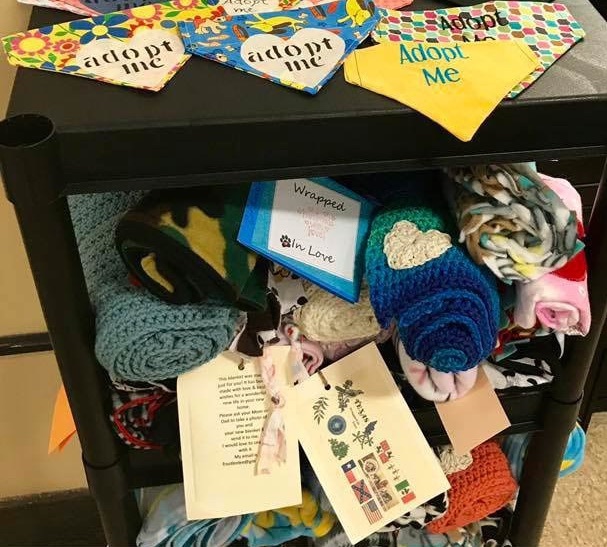 MHC has an ingenious volunteer program to help pets in need — the Adoption Blanket Project! We are looking for animal lovers who sew, knit, crochet, and make no-sew blankets to donate their skills and some time and thread to make these blankets for our rescued pets. When a pet is adopted, a blanket is given to their new owner which helps comfort the pet during their transition into a new home. This program is great for those who want to help rescued animals in an unconventional and creative way. THANK YOU ALL for sharing your talents. You may also see these colorful blankets inside the kennels at the Adoption Center. They help to make the kennels a little bit cozier and more comfortable for our pet guests. You can choose to make blankets OR donate fabric for other volunteers to use by dropping off fabric at our Adoption Center. As a volunteer, you will sew, crochet, knit, quilt or make no-sew fleece knot blankets for our pets! There’s only one rule: Make your blankets with LOVE, not PERFECTION! Our pets are looking for warmth and comfort, not straight seams and perfect corners! All experience levels are welcome to participate! Whether you're a master knitter or a novice crocheter, your skills will be appreciated! Need help figuring it all out? Help is always at your fingertips. Check out the instructions for making blankets and labels. Once your blanket/s is finished, simply take them up to our Adoption Center within Midland PetSmart. Tell the ladies at the desk that you have blankets for the Adoption Blanket Project and our staff will make sure they go home with an adopted pet.